Your pool is so much more than a place to go for a cooling dip on a hot summer’s day. It is the centrepiece of your backyard. So, you need to ensure that you put maximum effort into designing the entire pool area. It should showcases your little patch of blue in the best way possible. There are a number of elements you need to address if you’re going to create a visually stunning pool area. Before you even consider the aesthetics of your swimming pool fencing, you must satisfy the stringent safety regulations set out by Government bodies. For more information on ensuring your entire pool are is safe for the entire family, read Pool Fencing Regulations Explained. Once you’ve got all the safety elements sorted, it’s time to turn your attention to beauty and design. Your fence is the first glimpse people will have of your pool, so you don’t ruin the look of your entire backyard by choosing the wrong fence. The overall aesthetic you’re aiming for will dictate the type of fencing you choose. For a sleek modern look, glass or aluminium slat fencing are the best option. If you’re trying to achieve a more exotic, tropical feel, then you may want to go for brush fencing. A pergola is the perfect accompaniment for a pool. It also adds to your living space and you can turn it into the perfect outdoor room, complete with barbecue, an outdoor kitchen and anything else you feel will add to your poolside experience. A pergola will also help in drawing attention to your pool area and ensure that all the elements of your backyard converge at the most appropriate point. There’s nothing quite like the look of a beautifully hued timber decking up against a deep blue pool. Decking is also a great option for those that like something cool to lie on while they relax next to the pool and if maintained properly a decking will last forever. The best part about timber decking is that you get the advantage of placing a natural product next to your pool so you can highlight the natural elements and increase the escapism that your pool provides. Pavers and concrete are a popular option for hardscaping pool surrounds and for good reason. They are almost unrivalled in their ability to provide a low-maintenance yet stylish solution. For the budget conscious new concreting techniques, including stencilled and painted concrete, have opened up design options that were previously unavailable due to cost. For those that love the undeniable elegance that pavers provide, you’ll get endless enjoyment out of paving your pool area, especially when you use a specific technique to create a particular look, such as terracotta for a Mediterranean feel, or sandstone for a touch of Californian glamour. When it comes to landscaping, the best cues come from nature. If you think about your favourite beach, river or watering hole you’ll automatically think about the vegetation that surrounds it and adds to its appeal. Landscaping gives us the ability to mimic these natural looks by surrounding our pool with beautiful plants that change it from a concrete hole filled with water to a private oasis – think palm trees drooping over a pool or natural shrubbery framing your pool area. Every pool needs a blanket but you don’t want to ruin the aesthetic of your pool area by having an unsightly blanket on full view. The best way to avoid this eyesore is to have a pool blanket box built. You can turn the box into a real design piece for your pool area and you’ll also increase the lifespan of your cover by keeping it out of the sun for longer periods of the day. Your pump and filter should also be hidden from sight. You can have a box enclosure built to both hide the pump and filter and provide the extra storage you need around your pool. There are a variety of materials you can use to construct your pump and filter box, ranging from timber slats, to brush and even Colorbond. The beauty of Colorbond is that it is legendary for its durability and there are enough colours out there to suit every design scheme. The aim is to keep all of these aspects in mind while you come up with your design theme. Once you’ve decided on your theme it’s important that each element is created to reflect this theme. The worst mistake people make is trying to fit too many design ideas into one pool area, the best thing you can do is keep it consistent and ensure everything is tied together. 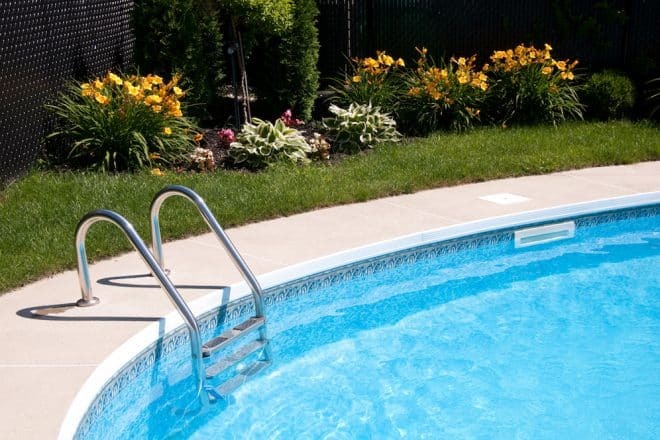 If you want to beautify your swimming pool area contact the landscaping experts at Everlast Services today!